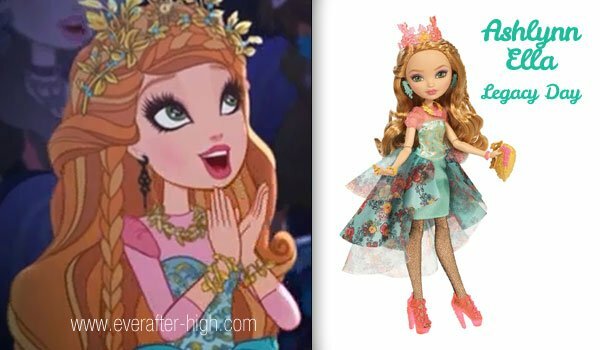 This doll of Ashlynn Ella features the Legacy Day outfit but there are several differences between the one shown at the webisodes and the doll one. Ashlynn’s hood is pink with a darker pink flower design with a gold trim with leaves. Her head’s piece looks a lot like a crown in pink with a gold jewel on the middle. Ashlynn has a beautiful brown hair, wavy at the very bottom. She has two braids at one side of her head. 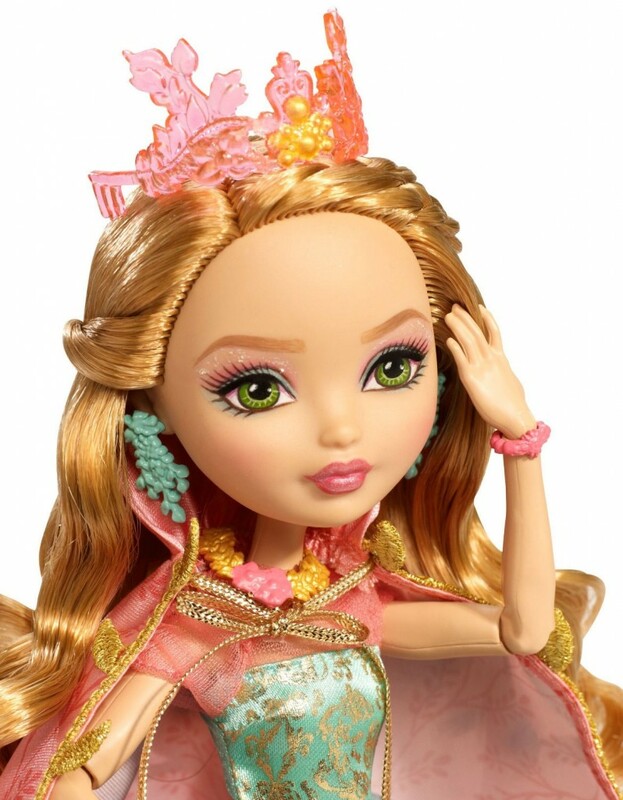 She has beautiful make up on, her eye make-up has some blue and pink and beautiful green eyes. For her lips she uses a darker pink color compared with her basic doll version. On both sides of her ears she has mint colored simple earrings with a floral design. She also come with two bracelets, one in pink and the other one in gold, and also a golden ring. 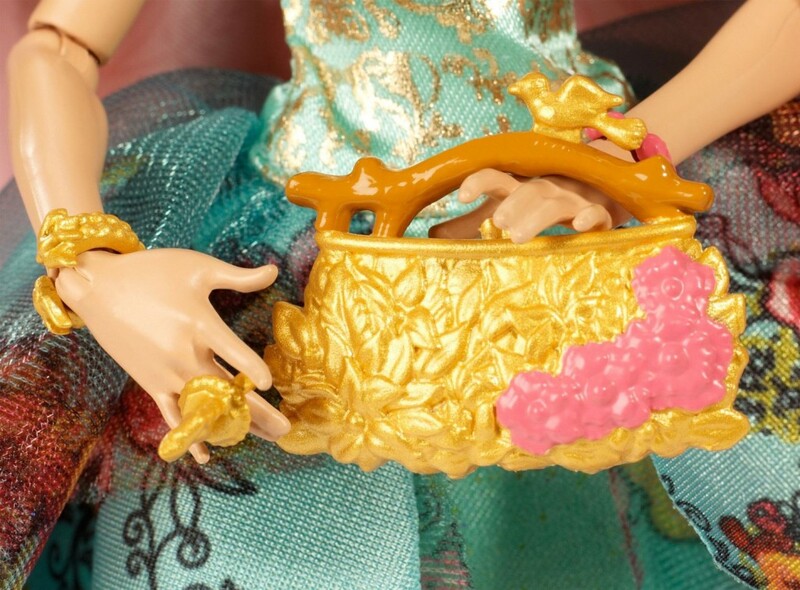 Her outfit starts with a beautiful gold necklace, with it is a lot like her purse, with two pink flowers in the middle. At the top of her chest she has pink and soft material t-shirt and the rest of it is beautiful mint green with golden designs. Her pencil skirt which is made of a really thick material. Attached just at the waist there are three layers of fabric with different lengths. On her legs she is wearing black fishnets stockings with some gold sparkle on them. Her pair of heels are a pink floral design really beautiful. She is sooooooooooooo pretty!!! 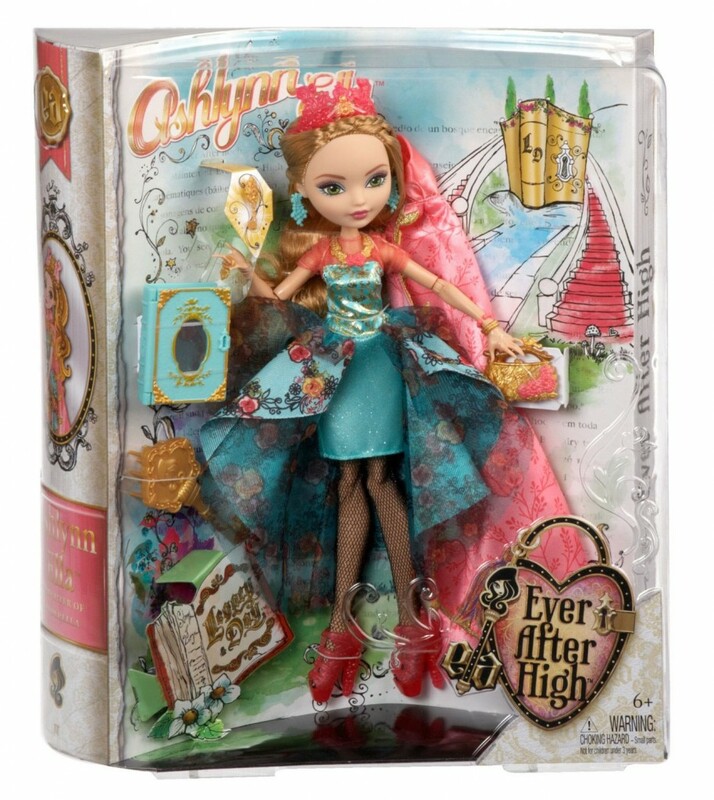 Really want her, also I have the first one with Hunter but I only got the set for Ashlynn. How come the doll is defrnet from the webisode? i have both the ashlynn ellas and i like this one better. isabelle ohair, where did you get her? I’ve been looking for her for a long time! the dolls do not smile . very sad .